I met the greatest – as he described himself from the boxing ring only for the sake of creating public international euphoria. But, with great conviction he told me, “The greatest is God almighty! I have come here to the holy land to meet him…” It was that legendary Muhammad Ali who bespoke thus. I was performing the pilgrimage of Haj, leading (as Amee-rul-Haj) the Sri Lankan delegation as the Minister of Muslim Religious and Cultural Affairs on the 9th day of Dhul Haj 1413AH (May 30, 1993), the day the entire concourse of pilgrims gathered at the valley of Arafa for the grand finale of the pilgrimage. As guests of the Saudi king, my family and I were accommodated in a tent in the Saudi royal family enclosure. There appeared in the tent some dark skinned guys in Ihram – the unsewn two-piece dress worn by all Hajis. “Muhammad Ali wishes to invite you, sir, to his tent for the midday meal,” was their message. 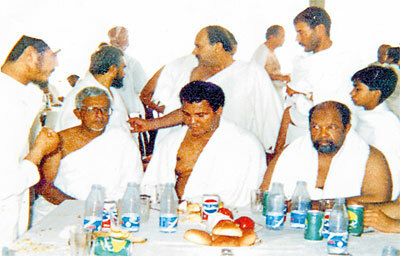 Former Minister of Muslim Religious and Cultural Affairs A.H.M Azwer being received in Muhammed Ali’s tent at the Valley of Arafa when he led the Sri Lankan Hajj delegation on pilgrimage. It was a warm hug for me from the king of the ring! I was simply overwhelmed. He bade me sit by his side at the makeshift table (it is not customary to lay tables inside Arafat tents; everyone was expected to sit on spreads on the floor and partake one’s meal. No scream, shouts or hysteria, Muhammad Ali-the-Great appeared so humble and subdued. Asking about Sri Lanka, he cut for me apples and oranges, served me rice and curry, olive fruits, bread rolls and salted milk (like lassi). I would still cherish the moment when I, three days after, bumped into Muhammad Ali in the posh hotel in Jeddah. He was in the foyer of the hotel playing shadow boxing with his little sibling. What a billion dollar worth ‘fight’ it was – the big dad was taking jabs from his ten year old Muhammed Ali the Junior, evoking much amusement among those present at the hotel foyer. What a sight to witness the Dad running around the sofa taking guard off the punches leveled at him by the small fellow. When Muhammad Ali brought his hands together to defend himself from the knocks of the tiny tot, I could mildly notice his million dollar fists were shaking and fumbling – the early sign of parkinsons. I offered a prayer on hearing of his demise, and sent my condolences to his family in Louisville, Kentucky in the U.S. May he attain the highest felicity in Jennathul Firdous!